If you're handy with a sewing machine, you can create special homemade gifts for friends and family. In addition to being cost-effective and fun, handmade gifts offer a creative way to show you care. Whether you're just learning to use your sewing machine or have been making handmade projects for years, these ideas will help inspire you to create a distinctive gift. The following three projects are ideal for sewing with children or as a starter project for new seamstresses. Love lavender or another pretty scent? To create a sachet, you can fill these handy little pouches with anything that smells nice. You can also fill them with rice or beans to make a fun set of beanbags for a special child. The process is easy, and you should be able to complete one sachet in about half an hour. Cut out two squares of fabric, measuring five inches on each side. Stack one square on top of the other, right sides together. Pin three of the four sides. Use your sewing machine to sew around three sides of the square, using a ¾-inch seam allowance. Turn the square right side out, and fill it with your choice of material. Turn over and pin the raw edges on the open side, and use your sewing machine to stitch this end closed. This classic apron style is as easy as it comes. 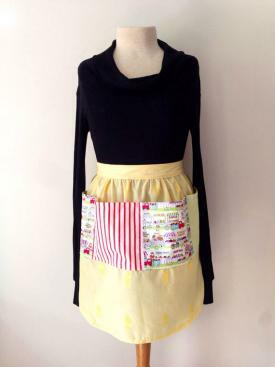 You can make these aprons as housewarming or shower gifts, and miniature versions make great presents for little girls. These are especially attractive when you make them with vintage floral fabrics. For best results, choose a material that is easy to wash and is not too thick. This simple apron will take most seamstresses between one and two hours. Spread the fabric out, and cut a piece that is 54 inches long by five inches wide. Cut another piece that is 36 inches long by 26 inches wide. Fold the 54-inch piece in half lengthwise, right sides together, and pin all seams. Sew both ends closed, leaving a ½ -inch allowance. Measure 17 inches from each end, and mark these spots with pins or a fabric pencil. Sew the seam closed to this point on each end. This will be the sash of your apron. Take out the pins, and turn it right side out through the open part of the seam. Press the sash, and set it aside. Hem the remaining rectangle of fabric on three sides, leaving one of the long sides raw. If your fabric has a set direction, make sure the raw edge is at the top. Take large stitches along the raw edge by hand or by machine. Pull the stitches to gather them until the edge measures 19 inches long. Insert the edge into the opening in the pressed sash, and pin it in place. Top stitch to sew the apron together, and then top stitch the entire sash ¼ inch from the edge of the seam. Press the apron when you're done. For added flair, consider adding a pocket, a lace edge, or other pretty details. Felt is a wonderful fabric to work with because it does not unravel. This makes a great introductory project if you're new to the art of appliqué. 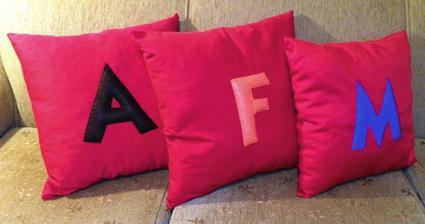 Since these pillows are personalized with a letter of the alphabet, you can give them as baby gifts, housewarming presents, and shower or wedding gifts. 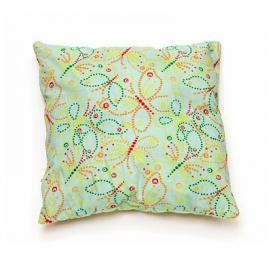 Since hand sewing takes a bit longer than machine sewing, expect to spend about two hours making your pillow. Use your computer's word processing program to select a font you like. Enlarge the font to 500pt, and select the bold option. Type the desired capital letter, and print the letter on a sheet of regular paper. Cut the letter out. Pin the letter to the felt, and use it as a pattern to cut out a felt letter in the same design. Cut two 16-inch squares of the printed cotton fabric. Hand stitch the felt letter to the right side of one of the squares. Place the right sides together, and pin three of the four sides. Use your sewing machine to sew around all three sides, leaving a one-inch seam allowance. Notch the corners, and turn the pillowcase right side out. Insert the pillow form, and turn over and pin the raw edges on the open end. Hand sew this end closed. If you're an experienced seamstress, create coordinating piping to use along the edges of the pillow. This will give it a more finished look. Sewing is a great way to create beautiful, one-of-a-kind gifts for the special people in your life. Personalize these gifts by choosing fabrics that represent the recipient or adding embellishments that make the gift unique. As with any gift, it's the thought that counts. Taking the time to sew a gift shows the recipient that you really care.